What Is the Meaning of Candles in the Window? The beacon of a candle in a window sends a spiritual message; the welcoming flicker sends a secular one. There are as many reasons to put a candle in the front window of your house as there are front windows, but there is one common precaution everyone should observe: burn the light safely -- far from flammable materials, curious children and pets, and never leave it unmonitored. An electric candle, with a bulb to replace the flame, is a more prudent choice for the holidays or anytime. 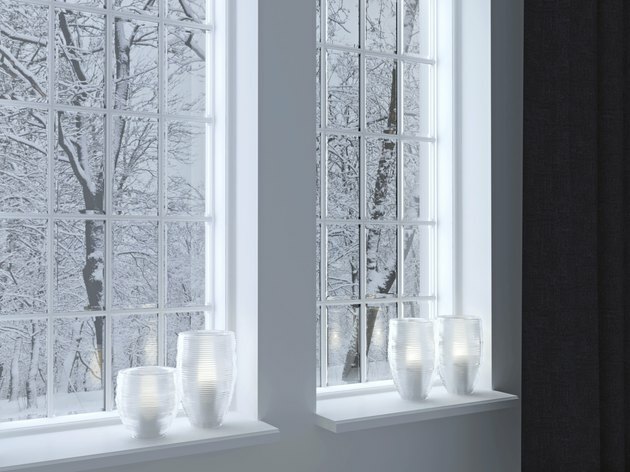 A candle in the window signals a readiness to engage with the world outside your home. In Ireland, Christmas replaced the pagan solstice and Protestantism attempted to replace Catholicism. History depicts the brutal British repression of Irish Catholics that outlawed priests and any practice of the faith. Priests went underground, traveling incognito to say Masses and tend to believers' souls. Irish Catholics took to leaving a candle burning in the window and the door unlocked at Christmas as a sign it was safe for a priest to slip in under cover of darkness. As the practice spread, the British questioned it and were told it was a tradition that symbolized pure and open hearts welcoming the Blessed Virgin, St. Joseph and the Baby Jesus wandering in search of shelter. The Irish who migrated to America brought the custom with them as a holiday practice. Homeward bound travelers in colonial America might be greeted with the sight of a candle burning in the front window. The welcome was part silent prayer for the safe return of the absent person and a sign that there was someone waiting and tending the fire. A candle might send a message out into the night -- that a child had been born or a family had received a windfall or blessing. During celebrations, the candle expressed respect for public figures or special commemorations. Bed and breakfast hosts lit a candle in the window to light the way to their door and announce there were available beds. The general sense of welcome symbolized by the candle helped the practice to spread to inns and homes at any time of year. Holiday windows bright with candles symbolize different spiritual traditions for those of different faiths. Christians see the candle as the Star of Bethlehem, the light that guided the Magi to the stable where Jesus, the newborn savior, sheltered. A menorah in the window is a Jewish custom that symbolizes the miracle of Chanukah when a single jug of oil was said to burn for eight days as the Maccabees recaptured, purified and rededicated the Temple in Jerusalem. Today a menorah in the window stands for the determination of the Jewish people not to be forced to assimilate into another religion and abandon their own faith. The tradition of burning a candle in the window survives as a sign of welcome, even when those lighting the tiny beacons are unfamiliar with the history and symbolism of the practice. It is customary to place candles in the downstairs front windows, especially in traditional-style homes with symmetrical architecture. Large versions of electric candles may be placed in sidelights or just outside them on a porch during the holidays to draw attention to the front door in a brightly decorated yard. And porch lights -- pendants, lanterns and all-weather sconces -- are the modern equivalent of the candle in the window, lighting the way home and welcoming visitors with a ray of warmth.